Manufacturer of a wide range of products which include 8600/8600 hdx series barcode readers. DataMan® 8600 series image-based ID readers provide the world's most advanced barcode reading technology for decoding Direct Part Mark (DPM), 2-D and 1-D codes of varying sizes, quality and marking or printing methods. 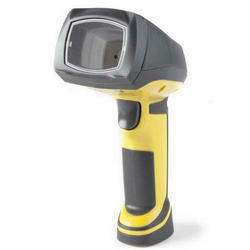 These handheld DPM barcode readers are designed for the harshest factory floor environments. Equipped with an advanced liquid lens imaging system and patented UltraLight® flexible lighting technology, the DataMan 8600 series of barcode readers decode the most challenging DPM barcodes on the widest variety of surfaces. The modular design supports corded RS-232, USB, and Ethernet options, as well as cordless Bluetooth and Wi-Fi options to ensure the DataMan 8600 series of readers are ready to meet your application communication requirements. The most powerful Cognex algorithms, 2DMax® with PowerGrid™ technology and 1DMax+ with Hotbars® technology, enable the DataMan 8600 series image-based readers to decode the most challenging DPM barcodes in the most demanding industrial conditions. For superior image formation on the most mark types and surfaces, the DataMan 8600 series features an improved, patented UltraLight®, faster image sensor along with a new liquid lens offering a larger depth-of-field. UltraLight illumination provides dark field, bright field and diffuse lighting all in one electronically controlled light. These technical advances enable the DataMan 8600 series readers to image barcodes faster and easier on the widest range of surfaces and at distances both near and far. Equipped with Ethernet communication and industrial protocols, the DataMan 8600 series easily integrates with industrial automation equipment, making installation and maintenance fast and efficient. Additional standards communication options include corded RS-232, USB, and Ethernet options, as well as cordless options including Bluetooth and Wi-Fi. Equipped with field interchangeable communication modules, one reader can be configured to meet specific and ever changing communication needs. Looking for Handheld Barcode Reader ?